Endoscopic treatment is the standard first-line management for non-variceal upper gastrointestinal (GI) bleeding. Recurrent bleeding occurs in about 10% to 15% of patients after the first endoscopy and is associated with significant mortality.1 Surgery has hitherto been the traditional treatment for non-variceal upper GI bleeding refractory to endoscopy. In recent years, transcatheter arterial embolisation (TAE) has been shown to be equally effective in control of bleeding and associated with fewer complications.2 3 4 5 6 Moreover, TAE avoids the risks associated with general anaesthesia. In our centre, TAE is the standard next step for endoscopy-refractory non-variceal upper GI bleeding. We believe that this practice can also be adopted in other centres where interventional radiology expertise and facilities are available. We experienced an 89-year-old woman with multiple medical co-morbidities including hypertension, mitral valve regurgitation, congestive heart failure, diabetes mellitus, and chronic obstructive airway disorder. The patient was admitted to Princess Margaret Hospital on 29 March 2017 with massive haematemesis. On admission her blood pressure was 105/60 mm Hg, heart rate 100 beats per minute, and oxygen saturation 97% in room air. Pallor was noted on physical examination and per rectal exam was empty. Blood results revealed a haemoglobin level 8.1 g/dL, platelet count 225 × 109/L, international normalised ratio 1.0, creatinine level 144 μmol/L, and urea level 17 mmol/L. First oesophagogastroduodenoscopy (OGD) arranged on the same day immediately following admission revealed a 3-cm roll-edged ulcer (Forrest IIa) at the fundus of the greater curvature. Biopsy was taken. Haemostasis was achieved by endoscopic application of one haemoclip and injection of 4 mL adrenaline 1:10000. An intravenous proton pump inhibitor was started but the patient developed a further massive haematemesis a few hours later. Repeat OGD revealed a large adherent clot over the same ulcer. After removing the clot, spurting was noted adjacent to the haemoclip (Fig 1). Endoscopic interventions included adrenaline injection (totally 13 mL 1:10000 adrenaline) and application of haemoclips and haemospray. Despite these measures the patient became haemodynamically unstable during the procedure and required urgent intubation by an anaesthetist for airway protection. The patient also required large-volume blood product transfusion and high-dose inotrope. 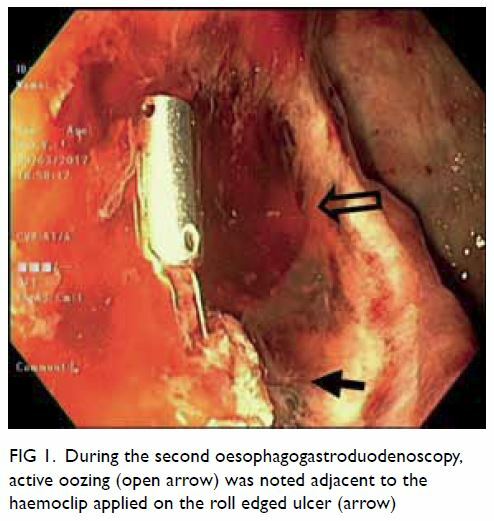 The intervention radiologist was consulted urgently and the patient directly transferred from the endoscopy centre to the interventional radiology suite about 1 hour after completion of the second OGD. Arterial access was obtained at the right common femoral artery. Celiac artery angiogram revealed a pseudoaneurysm at the mid splenic artery, corresponding to the site of haemoclip on digital subtraction angiogram image. Selective angiogram of the splenic artery confirmed the finding of pseudoaneurysm and active extravasation from the pseudoaneurysm was demonstrated. Exclusion of the pseudoaneurysm was achieved using a sandwich embolisation technique at distal, and across and proximal to the neck of the pseudoaneurysm, blocking the efferent (back door) and afferent splenic artery (front door). Seven fibered platinum coils were used. Post-embolisation angiogram confirmed the pseudoaneurysm had been obliterated. Normal blood flow to the spleen was also obliterated and the spleen was perfused by collaterals from the pancreas (Fig 2). The total procedure time for angiogram and embolisation was about 45 minutes. The patient’s haemodynamic status and haemoglobin level rapidly stabilised after the procedure. During resuscitation, the patient received a total of 1 L gelofusine, 7 units of packed cells, 4 units of fresh frozen plasma, and 4 units of platelet concentrate. The patient was extubated the next day. Her condition continued to improve, and the patient was discharged to a convalescence hospital 2 weeks later. She did not present with any signs or symptoms of splenic infarct. The pathology report of the gastric ulcer confirmed it as benign. To date, the patient has not presented with any signs or symptoms of upper GI bleeding or significant haemoglobin drop. Follow-up OGD was not arranged in view of the patient’s advanced age and because it would be unlikely to influence subsequent management. The splenic artery pseudoaneurysm appeared to be caused by a benign gastric ulcer at the greater curvature eroding into the splenic artery. Fewer than 10 such cases have been reported in the English literature. The successful management of this case of rare massive upper GI bleeding highlights the importance of collaboration between endoscopist, anaesthetist, and interventional radiologist. Timely involvement of an interventional radiologist after failed endoscopic haemostasis not only allows rapid diagnosis of the underlying aetiology but also allows embolisation to stop bleeding at the same time. The source of bleeding is often first identified at endoscopy, guiding subsequent angiography, and TAE. The principle of TAE is to selectively obstruct or reduce blood flow to the bleeding point and minimise ischaemia in the rest of the GI tract. Generally speaking, the risk of ischaemia in upper GI bleeding is small because of the rich collateral circulation in the stomach and duodenum.13 The rich collateral arterial network in the upper GI tract nonetheless also causes treatment failure as blood flow to the bleeding point may persist through retrograde flow from collaterals.13 This problem can be overcome by superselective embolisation of the bleeder branch using a small microcatheter.12 When contrast extravasation or pseudoaneurysm is detected in a large vessel such as the gastroduodenal artery or left gastric artery, the artery can be trapped by coils placed across the point of extravasation or pseudoaneurysm, so as to close the “front door” and “back door”.13 Recently, impressive results have been reported with superselective embolisation using N-butyl cyanoacrylate glue.12 13 N-butyl cyanoacrylate embolisation has a shorter procedure time and occludes the target vessel independent of the patient’s coagulation system. It is particularly useful in patients who are haemodynamically unstable or coagulopathic. Successful performance of TAE relies on centre expertise. The published studies of TAE were performed in high-volume centres with a specialist interventional radiology service. The results might not be reproducible in smaller centres. Another consideration is the availability of an interventional radiologist and angiography suite out-of-hours. Longer time to angiography was found to predict early rebleeding and every effort should be made to perform TAE early, even outside office hours. Lack of access to a 24-hour interventional radiology service in smaller centres is a major barrier to the routine use of TAE. Transcatheter arterial embolisation is an effective and safe treatment and compares favourably with surgery in the management of endoscopy-refractory non-variceal upper GI bleeding. In centres where expertise and facilities are available, TAE can be considered the routine next step management when endoscopy fails to control bleeding. Concept and design: All authors. Acquisition of data: HF Chan. Analysis or interpretation of data: All authors. The patient was treated in accordance with the Declaration of Helsinki. The patient provided informed consent for all procedures. 10. De Wispelaere JF, De Ronde T, Trigaux JP, de Canniére L, De Geeter T. Duodenal ulcer hemorrhage treated by embolization: results in 28 patients. Acta Gastroenterol Belg 2002;65:6-11.